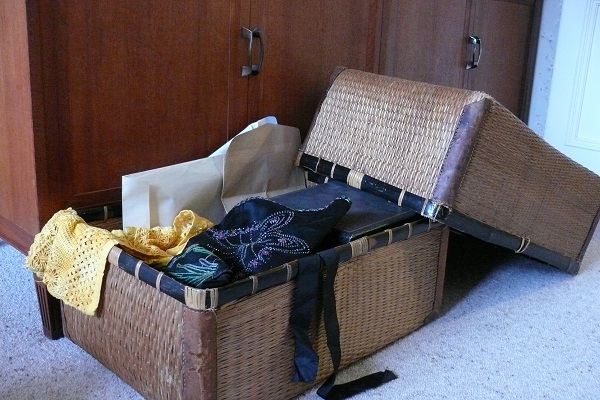 “This” was a wicker dress-basket crammed with handcrafts, photographs, and other family memorabilia from the late nineteenth and early twentieth centuries. The letters were packed in large envelopes. They looked and smelled much older than anything else in the basket, and were written in a script resembling Elizabethan/Jacobean italic – though with many blots and smudges. My neighbour said she’d had a go at deciphering them, but had given up. Some inky little drawings made her think they were the work of children. Clever children? Certainly. Her great-aunts had been fond of pranks, and the letters were probably a tale of family pets, written while one or both had been away at boarding school. She told me to chuck them in the recycling bin, and help her sort and label the old photos while she could still remember who was who. Which I did. However, the thought of those bright, industrious children stayed with me, so I asked if I could take the letters home for a closer look. She hesitated, frowned, and then agreed. After many evenings spent poring over the “letters” I reached a few conclusions. Some seemed to have been written with greater ease and confidence than others. That indicated they were the work of either one child whose skill improved over time or two children, as my neighbour had said. Some words, by their frequency, were easy to pick out. For example, “arrkst”, “catt”, “keween”, “loorrt”, “maarrk”, “niewes”, and “sayt”. The code was simple. 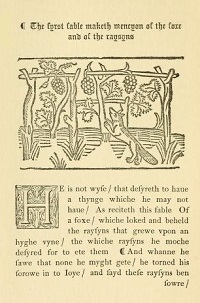 It relied on the overuse of vowels and certain consonants (f, k, p, s, and t). Some consonants (b, d, g, q, and v) didn’t seem to be there at all, so the others had to be doing double duty – as themselves and as substitutes. They weren’t letters. None of the papers had a date or address on them, though a few were signed by someone called Kip. Whenever I visited my neighbour at the retirement home, I gave her an update on my progress with “the letters”. She wasn’t particularly interested, but w hen I suggested they were older than she thought, and had been written by a couple of inventive Elizabethan children familiar with Aesop’s fables and Beware the Cat, she became downright hostile. That was it. The papers weren’t the work of children. They’d been written by cats. Elizabethan cats. And the code was the cats’ attempt to use the English alphabet to reproduce the sounds that they could make and therefore hear. I think my neighbour also knew this, but there was no way she would admit it now she was old but “not yet so doolally”. Incredible? Maybe. Improbable? Yes. But, given the level of literacy achieved by some Elizabethans, not impossible. As late as 1809 William Bingley (quoted in Keith Thomas’s Man and the Natural World) noted that cats were “susceptible of considerable educational attainments”. 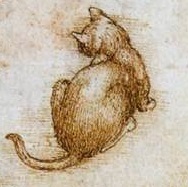 A Da Vinci Cat, doubtless skilled in codes. I rushed home, and began transcribing the papers. Very secretly, I might add, because I often have to sound out whole lines, and I do produce strange noises. In my transcriptions I’ve taken liberties with punctuation, spelling, and word choice, though I’ve tried to keep the flavour of the originals. Fortunately, the papers, though undated, seem to have been kept in approximate chronological order, or were sorted that way by my neighbour. 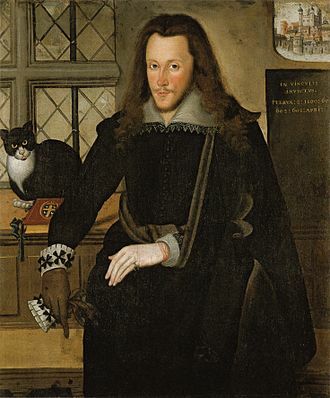 Once I’d convinced myself that the papers were written by cats and whose cats they were (Henry Wriothesley, 3rd Earl of Southampton, is undeniably Owerroon Errrl, or Our Own Earl) I’ve had little difficulty finding the historical evidence to support my conviction. Some of this evidence is included in notes at the end of a post. More detailed information may well require separate pages. However, where the feline observations differ from the historical record I’ve taken the cats’ word for it. Even though they’re not always as good as they should be at distinguishing fact from fantasy. Aoessommee! Did I get the code right?!!! What do cats say when they look at your artwork? (Particularly their own portraits, of course.) I think it might be Orrrrsm! You’re far too modest, Shafali. And I don’t know the Cat Code for that, because although Gib seems to have a keen sense of physical modesty (in his second “book” Some Words About Me he didn’t like people looking at his privities, or as he spells it, “prriffties”) I haven’t seen much intellectual modesty in what I’ve transcribed so far! Do publish these in a book–it is great work. Of course, the cats will get all the credit! The cats will deserve it. Where would I be without those papers? As I was reading this I couldn’t help but think that, A) you’re really clever, and B) this would make an amazing movie. Thank you so much for that. I don’t doubt that Gib thinks he’s clever, but I’m just the humble editor! My writing buddy who lives a few doors down the street from me also thought a movie, but as these are feline memoirs and observations rather than an ongoing story I don’t think a movie would work. I agree with sarahbruso, this would make an amazing movie. How truly fascinating! I’m so intrigued. As the steward of several cats, I adore this! It has taken me forever to comment because I wanted to catch up with the reading, but wanted to comment here at the beginning! Brilliant! My feline companions say so too! Thank you! And I’m glad your feline friends approve. My cat is giving me the evil eye because I am messing with my laptop AGAIN! He wants me to play, I want to write. Or perhaps he wants to use the laptop? Yes, it’s a miracle the papers have survived all these years! Thank you! I’m looking forward to spending some time browsing your blog. Thanks! I suspect modern cats have got lazy, and prefer to doze in front of TV rather than write. But spying on the neighbours is still a favourite pastime.